The Small Guide to Big Ideas. 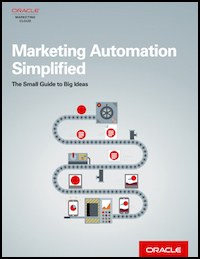 Marketing Automation is much more than "email marketing". Integration of various digital assets, including social, improves your CX by delivering the right content to prospects and customers when they need it. "Companies that implement lead management systems are enjoying a 10% increase in overall revenue"
Please subscribe me to Marketing Automation insight.